Life in today’s jungle always involves machines. 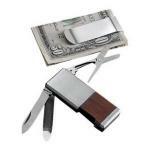 A simple pocket knife is a big help in ordinary situations, but as life becomes more and more technical the little emergencies of day to day existence call for ever better tools. 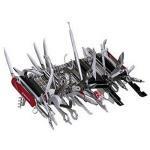 A few decades ago the Swiss Army knife was something people stared at a lot but were somewhat embarrassed to own. 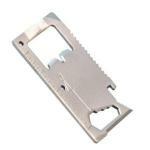 Today they happen to be one of the best options in a practical pocket folder. 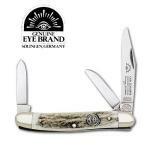 Though Victorinox was the first to offer the do-everything knife, many other companies offer equally good alternatives today. 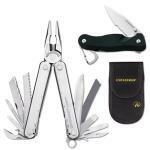 Instead of including a tiny foldout pair of pliers as a blade, the knife blades and other tools fold into the handles of the well known Leatherman Multi-tool, a favorite of travelers and handymen. 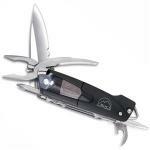 Specialty multi-tools are now designed for particular vocations, hobbies and emergency uses. 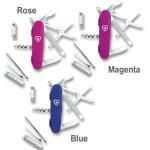 While years ago the approach was to provide an assortment of tools for any situation, today blades and tools are put together in appropriate combinations. 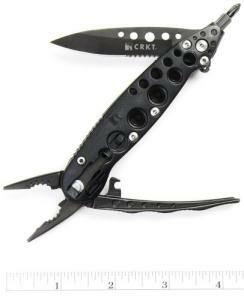 There’s a multi-tool for fishing, another for computer repair, another for golfers, and so on. 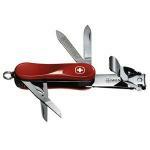 Swiss Army followed the trend, but usually still includes their traditional parcel hook and toothpick, just in case. Those who think outside the box can appreciate the renegades — new ideas in new forms, produced by companies you may never have heard of until they won the industry’s top honors for best knife. 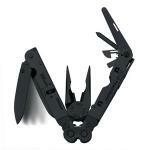 The award-winning Tool-Zilla Jr. is our choice for Best Multi Tool. 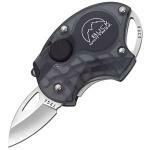 It’s from Columbia Knife and River provides strong basic tools and a good knife blade. 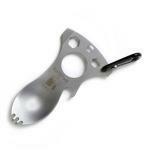 Columbia’s Guppie converts to a functional crescent wrench. 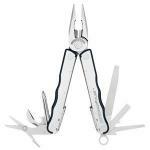 Forget chewing things up with the pliers, use this. 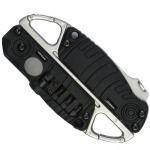 The Swiss Army Rescue Tool from Victorinox is a great emergency knife for the urban traveler. 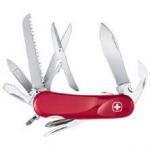 For over a century, Wenger was fierce competition for the better known Swiss Army brand, Victorinox. 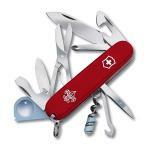 In 2005, when Victorinox took control of the Wenger name, both brands continued to provide Swiss Army products - Victorinox as the "Original Swiss Army Knife" and Wenger as the "Genuine Swiss Army Knife." A sunny day. A large, comfy blanket. Some eating utensils, paper plates, napkins, and a wicker basket filled with sandwiches, fruit, cheeses, wine, and something for dessert. 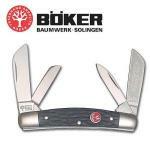 This, and your Victorinox Picnicker, is all you will need to pull off a wonderful afternoon outing. 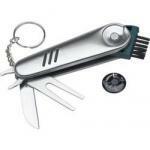 Whoever said "fashion" and "fix-it" don't mesh certainly hadn't come across this multi-tool yet. 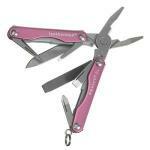 It's the Leatherman Squirt P4 coated in a generous dose of powder pink gloss, hoping to entice a few more market segments with its delicate hue. 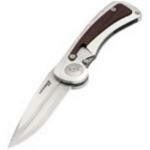 Victorinox understands that instilling safe knife practices at an early age will equal future customers down the road. The philosophy is: get 'em early, make sure they don't kill themselves, and you've taught another generation of knife lovers the value of a Swiss Army knife. 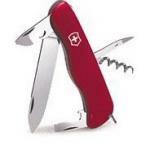 The Victorinox Tinker is appropriately named. 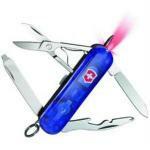 Imagine tinkering around with a broken flashlight or an old portable radio - imagine the tools you would most likely need - and you could complete the job with everything found on this Swiss Army pocket knife. 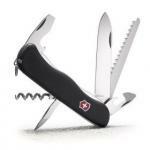 As far as Swiss Army knives go, this Victorinox model embodies the word "classy." It's the Victorinox Cigar Knife, and is a great choice for any cigar aficionado that wouldn't mind carrying a few extra tools along with a cigar knife in one sleek little package. Columbia River Knife and Tool Zilla Jr.
ZTech is a company which manufactures a wide variety of golf-related equipment and accessories: from club head covers to umbrellas to ball marking pens. The chances are good, if you can think of something, and it somehow pertains to golf, ZTech has one available for purchase at an inexpensive price.